Picture this: Neeta works in the corporate sector. It takes her over an hour, in heavy traffic, to commute to and fro from work. After coming back home at 8:30, each day, she makes dinner, attends to her kids homework demands, packs lunch for everyone, puts her kids to sleep, cleans up and then heads to bed at 11:45. Not before she does her hair and sets herself up for the rushed morning routine, due to start in five hours! Nitin, who works in IT, is struggling hard to plunge a few leaps forward in his career. He too commutes for an hour and a half, in an overcrowded local train from a nearby suburb, standing ear to ear against another fellow passenger. He spends an average of 14 hours, each day, in working and commuting. Except for maybe the sixth day, which has been generously labeled as a half day, whatever that means! What makes an average Indian’s work-life balance sound like a page from Dante’s Inferno? Well, the fact that based on a study for Arcadis’ Sustainable Cities Index of 2016, all the major Indian metros have less than 20% people index. In layman speak, it means that work-life balance, among other factors such as affordability, income equality, gender equality, health, education and crime reduction, are in need of a do over. Work life balance is important. Trust the experts. They say that a severely biased focus on your job can compromise your relationships, your mental and physical well being, and ultimately your focus and efficiency at work, making the point of the added attention to work quite pointless. Well, same goes for trouble in your personal affairs. It does find a way to creep into your profession. 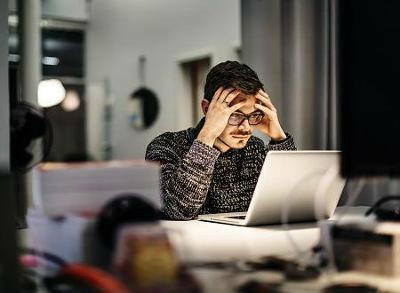 People suffering from a lack of a happy medium may go through at least one of absenteeism, high stress, low productivity and in its worse, job attrition. Employers too suffer from high employee turnover, lack of efficient workers, MIA workers and an over all lack of skilled employees, who find it better to just quit and move to more love. But what are the factors that are probably playing into this low quality of work-life balance, among Indian workers? And what measures can be taken to improve? Women, in our country, are faced with a more difficult work-life balancing act as compared to men. A study published in the Indian Journal of Psychological Medicine, there are two factors that trouble working women, especially ones with kids and aging family members, Family-Work (FWC) and Work-Family (WFC) conflicts. According to the study, done on urban women employees with a mean age of 38.7 years, with none to two children, both the factors are highly affected by their circumstances. FWC, which is a measure of how work negatively impacts ones’ family, and WFC, which is a measure of how badly home affects ones’ work, were measured and statistically analyzed for 90 participants. Both the factors showed means reflecting a troubling pattern of a negative spill over. Subjects, with children, had a significantly bad influence coming from their complimentary sphere of life. Family expectations, household demands, uncompromising company policies, unsupportive supervisors and the inflexible work schedules add to the grief of working women. Read How to manage motherhood and career. What you see is more women leaving the work force after unsuccessfully juggling two demanding roles – Superwoman and Mama Bear! Unfortunate, as it is, in the last decade, the Indian female labour participation has gone down to 27% from the 37%, the decade before, based on data from the International Labour Organization. Maybe a move in the positive direction would be to make it possible for women, especially mothers, not to be pushed to a corner, making a Sophie’s choice between their family and the work that supports them financially. It is not hard to conjure up some measures to help them out. Besides a cultural overhaul where husbands, and the society at large, realize their roles in sharing responsibilities, companies too can do their yearly good deeds by initiating certain policies, which will come later in this article. A solid work life balance means having a meaningful participation in all the aspects of a wholesome life – family, work, friends and yourself. According to a study on millenials everywhere, the Manpowergroup has gathered data showing the number of hours worked by country. The report says Indian millenials put in the longest number of working hours per week. 52 hours to be exact. 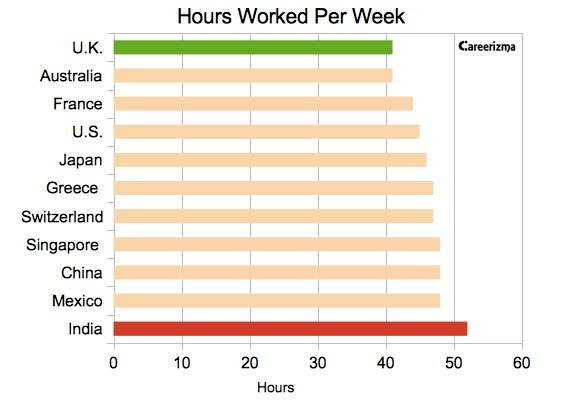 Compare that to China’s 48, USA’s 45 and UK’s 41 hours. With an average of over 10 hrs at work and sometimes a six day work week, there can be very little time left to stop and relax. Fierce competition, and the fear of losing your job, can make the chance, at having home and job satisfaction, thinner than your desired waistline. Add to this the grim situation of a boss from hell, with managerial qualities learned from a guy named Lucifer, with two horns. It isn’t uncommon to hear employees speaking fondly of their untaken leaves, with a forlorn look of vacations never taken and trips never had. Indian metros have a well known traffic notoriety. Making your way through the teeming number of cars can make even NASA’s New Horizon’s 26 year trip to Pluto seem short! A large number (about 49%) of surveyed people, probed by the Ford Motor Company in various countries, spend over 12 hours a week behind the wheel. What can make the experience extra edgy is the rather unpredictable driving habits of people you share the roads with. The already heavy 52 hour week with the additional 12 hours of slow motion commute can make the time spent at home short enough to make your family members feel like mere acquaintances. But is there no hope? Well, for starters, companies can come up with certain policies to aid the well being of their staff. At the cost of appearing like Santa, all they need to do is instate these measures, Christmas or no Christmas. Flextime: It gives you the ability to choose your own alarm o’clock. That way women, and men, can choose to divide their work hours to not have them be in conflict with their children’s demands. As long as the prescribed number of hours are clocked in, you can choose your own start and finish lines. Child Care: Takes the pain away from having to leave kids behind. Some of the big corporations, in India, have already adopted serving their staff with facilities to help them house their kids within, or near, the company premises. Maternity leave: Under the Maternity Benefit (Amendment) Act of 2016, the maternity leave has been raised from 12 to 26 weeks. For women, with more than two children, the leave is compressed to 12. This is a great move towards making it possible for women to not leave their careers behind, upon the arrival of a new born. Paternity leave: India is among the world’s top five countries offering days off for new dads. And more than 75% of Indian based companies have adopted this goodwill gesture, according to data from Mercer. Telecommunicating: In other words, work from home. Many companies are now open to the idea of letting their employees work from home. This aids, not only parents with kids at home, but also ones with sick or aging family members. Not to mention, a day without the arduous commute, is just another day in paradise. Time Management: This one is as much as a management responsibility as it is yours. Try to prioritize your tasks to get organized about your assignments. That way the likelihood of a conflict, with you having to do it in your leisure time, reduces. Read Time Management Skills for Employees and Managers. Compressed Work Weeks: This is what may be likened to the action of pulling a bandaid in one go. Getting the unpleasants out of the way in one quick compressed fashion. Not that all work is necessarily unpleasant, but nevertheless it leaves individuals with a nice chunk of time for family and self. Let’s say instead of 10 hour schedules for 5 days, the work week becomes that of 12 hours daily, for 4 days. It comes to roughly the same number of hours a week, but you are left with a three day weekend instead. And then, when has a 10 hour day stopped you from working beyond the end of the 10th hour? Job Sharing: A very milke bojh uthana type format where multiple people are trained to fill one full time job. That way each team is equipped to handle a job, leaving room for workload sharing, if needed. The fight between your professional and personal lives, is an eternal one. Some manage to chalk out a plan, while others get some help from their companies, and the policies that their country has to offer. India has been working towards making things easier for the working population, and hopefully there will come a time, soon, when there will no longer be the need for excessively long working hours, women having to leave their career dreams for their families and people spending a lifetime at traffic lights, on their way to work. The balance of work and family needn’t be a sour subject. One exists because of the other and neither should be responsible for tearing you into two. Find your happy medium and let there be harmony for the most part. It is important for individuals, and the society as a whole, to recognize the value of keeping the two separate and individually content. Habits, policies and even social outlooks can bring about the positive change that so many employees are yearning for. Those are the aspects to focus and work on. And as for the ones stuck in traffic and unable to crawl ahead, may you get a chance to say hello to the 5th gear. Go Green! 1- No labour laws for the middle class: As most of the 8-hour-work period is only on paper, there is no one there to check whether this is actually happening. Therefore having no work laws makes companies get away with forcing employees to work beyond hours. 2- High competition due to high population: In a country where for every one position there maybe over 500 applicants, it means that India is an employers’ market. If someone refuses to work beyond office hours, the person is subjected to mental harassment, comparison, slowed promotions and even refused a raise. In worse-off cases, companies just fire the people citing opaque reasons. 3- Disunity among Indians: Despite what you might see in a cricket stadium with Indian waving the national flag and cheering for their country with unity, outside the stadium it is the opposite. In fact, jokes go around that to weaken India, you don’t need to be an enemy; just befriend a section of one of India’s many societies. Soon they will just in-fight and drag each other down. India’s corporate sector is particularly disunited and filled with envy and competition which transcends even cooperating each other for the collective benefit. White collared Indian employees would never stand with each other against unjust company policies. As a result, unscrupulous employers are able to pick individuals and intimidate employees into submission. Good article!! A fairly good portryal of the current scenario.